Lian Li has announced a pair of mid-tower cases, both based around the same internal design with one featuring modifications to support near-silent computing: the PC-B16 and PC-A61. 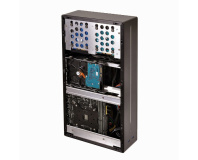 As you might expect of a Lian Li case, both are based around a brushed-aluminium finish. Each includes support for plenty of hardware: CPU coolers up to 170mm in height, power supplies up to 280mm in length and graphics cards up to 420mm in length are supported as standard, and both include 30mm of cable management space behind the motherboard tray. 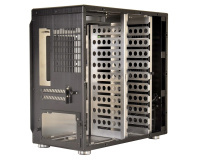 A tool-free design extends to the drive bays, six of which are independently removable and support 2.5" or 3.5" drives - with room for an additional 2.5" drive behind the motherboard tray - and a 5.25" modular drive cage supporting three half-height devices. 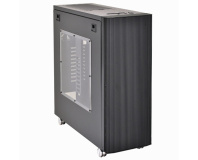 The overall design of both cases is remarkably similar, right down to the tool-free side and top panels, support for radiators and sealed-loop liquid coolers up to 280mm in size, and a top IO panel featuring four USB 3.0 ports, HD Audio connectors and a panel behind which the ports can nestle when not in use. Where they differ is in their finish: while the PC-A61 is a straightforward metal case, the PC-B16 variant comes with sound-absorbing foam lining the side panels, top panel and lockable front door - missing from the PC-A61 - to reduce noise. Both cases come with a pair of 120mm front intake fans and a single 120mm rear outtake fan. Lian Li has confirmed plans to launch both cases in the UK later this month. The PC-A61 will be available in silver and black finishes - PC-A61A and PC-A61B respectively - at £119, or as the PC-A61WX with a windowed side panel and black internal finish for £144. The PC-B16 will launch in black only as the PC-B16B, priced at £144. More details are available on the official pages for the PC-B16 and PC-A61.